The Isle of Rum is a National Nature Reserve managed by Scottish Natural Heritage and renowned for its wild landscape and long studied population of red deer. The island is of national and international importance for both its geology and its wildlife. There are several walks on the island, the historic Kinloch Castle and plenty of opportunities for wildlife watching by land and sea, as well as time to enjoy stunning views and the relaxed Island lifestyle. 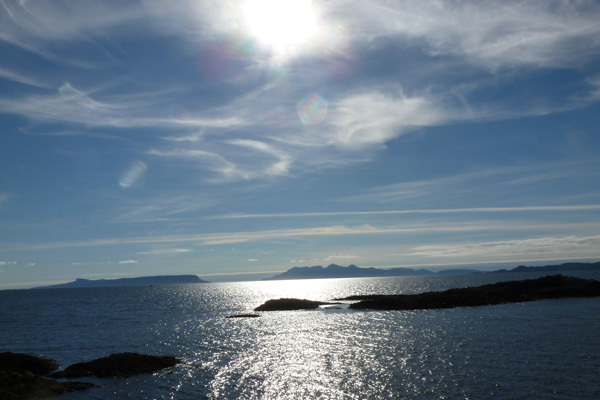 The Isle of Rum forms part of the Small Isles National Scenic Area, as well as being a Site of Special Scientific Interest, a Special Area of Conservation, a Special Protection Area and a National Nature Reserve. The island also supports a number of ancient monuments of national importance, reflecting its long occupation. The island is believed to have been inhabited for over 8,000 years, reaching a maximum population of over 400 in the late 18th century. The island is a product of intense volcanism in the Palaeogene era (65-23 million years ago), with a large caldera occupying the southern part of the island. The basalt and gabbro rocky peaks of the Rum Cuillins form the central and southern belt (of which Askival and Ainshval are Corbetts), with smaller granite hills to the west from the Quaternary Period. Torridian sandstones and shales dominate in the north and east, and ancient Lewisian Gneisses are exposed in the south east. Dykes and fissures bear further testament to an intense period of volcanism, with clusters of basaltic dykes associated the northwest coast. Climate and sea level changes have further sculptured the landscape, producing the raised beaches between Harris and A'Bhrideanach, as well as periglacial landforms (including boulder sheets and banked terraces) in the west. The ice has also been a powerful erosive agent in shaping the topography of the landscape. There is an abundance of wildlife on Rum reflecting the mosaic of habitats underpinned by the varied geology and topography of the island. The island supports species assemblages associated with grassland and montane grassland, wet, dry and montane heath, salt marsh, blanket mire and deciduous/ coniferous woodland, as well as coastal, freshwater and marine habitats. The island flora contains a number of orchids including marsh orchids (Dactylorhiza purpurella and D. incarnata ), heath spotted orchid (D. maculata), early purple orchid (Orchis mascula ), fragrant orchid (Gymnadenia conopsea) and greater butterfly-orchid (Platanthera chlorantha ), as well as the less common bog orchid (Hammarbya paludosa), frog orchid (D. viridis), small-white Orchid (Pseudorchis albida), lesser twayblade (Listera cordata) and lesser butterfly orchid (P. bifolia). Nationally important alpine species, include field gentian (Gentianella campestris), purple saxifrage (Saxifraga oppositifolia), mountain avens (Dryas octopetala), wood bitter-vetch (Vicia orobus), and alpine penny-cress (Thlaspi caerulescens). Other national rarities include Lapland marsh orchid (D. lapponica), Arctic sandwort (Arenaria norvegica), Pyramidal Bugle (Ajuga pyramidalis) and the endemic eyebright (Euphrasia heslop- harrisonii), a priority species in the UK Biodiversity Action Plan. Over forty species of fern, including the nationally scarce pillwort (Pilularia globulifera), 469 species of bryophyte and 400 species of lichen have been recorded on the island. The black-tufted moss (Glyphomitrium daviesii) and the Skye bog-moss (Sphagnum skyense), the latter endemic to Rum, Harris and Skye, are listed as nationally scarce. The island also supports a diverse mycobiota with around 900 fungal species recorded, including several internationally scarce species of wax caps (Hygrocybe spp). Over 205 species of bird have been recorded on the island or in the coastal waters, of which 13 are BAP species. The island supports a rich assemblage of sea and coastal birds, including a large breeding colony of Manx shearwater and several breeding pairs of red throated divers. Both golden and sea eagle also breed on the island, as well as other raptors including kestrel and merlin. The mammal fauna of Rum consists of otters, red deer, pygmy shrew, wood mouse, pipistrelle bats, Daubenton’s bats, as well as grey and common seal. There are also small herds of Highland ponies, Highland cattle and goats on the island. Over 2400 species of invertebrates have been recorded, of which 62 are national scarce and 15 are listed in the Red Data Book. Of these 500 are moth species and include the narrow-bordered bee hawk-moth (Hemaris tityus). Look out for dragonflies associated with moorland habitats (11 recorded species), including the Scottish endemic azure hawker (Aeshna caerulea). 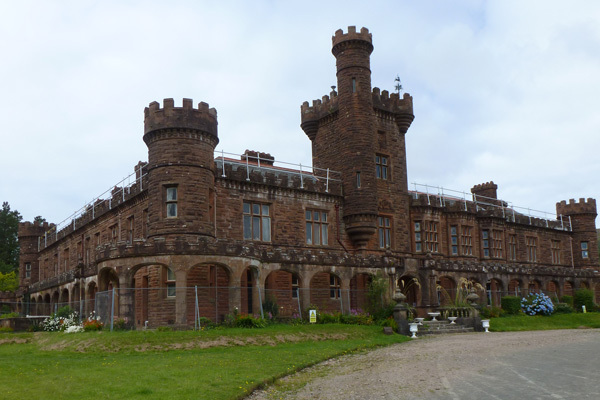 Kinloch Castle is a turreted, two storey castle, with an arcaded veranda, built by the wealthy Lancashire industrialist George Bullock in 1897. The building was designed to befit the requirements of an extravagant and lavish Victorian lifestyle. Fine craftsmanship, state of the art’ facilities and the most modern of conveniences of the time characterise the building, which has been described as ‘ a temple to private indulgence’. Outside, a great variety of exotic species were planted in the formal and informal gardens around the castle, as well as a bowling green and golf course. Unfortunately, the gardens are now a little unkempt and overgrown and form an uneasy alliance with the native flora. However the bridge from the Japanese Garden remains intact, but little remains of the hot houses and palm houses of this magnificent and extravagant residence. There is a guided daily tour around the castle, lasting about one hour, and timed to fit in with the arrival of the ferry service. The castle is well worth a visit, if just to marvel at the extreme opulence and indulgence of an age long since vanished. George Bulloch was also responsible for building two mausoleums, the first destroyed on the grounds of its poor design, and of which only a few decorated tiles now remain. The second mausoleum, in the form of a Doric temple, was built in Harris Bay to the west and houses the family remains. Visitor Centre, public toilets, a camp site, hostel, bike hire, SNH Reserve Office, community shop, post office and village hall (with tea shop) in Kinloch (the main settlement in the east) and two mountain bothies. Walking, wildlife, cycling, boat trips, fishing (loch and river), deer stalking and ranger talks and tours. There are also daily guided tours around Kinloch Castle. 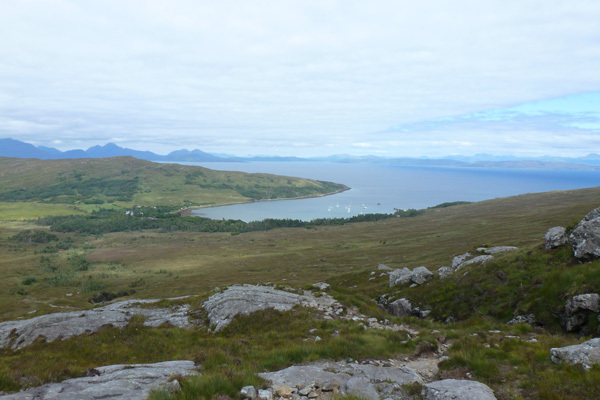 There are three short walks around Kinloch, the Northside Nature Trail, the Otter Hide Trail and the Coire Dubh Trail. 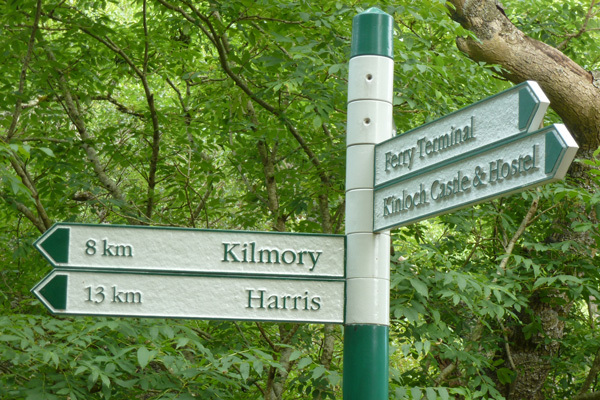 Longer walks include an 8km walk to Kilmory and 13km walk to Harris. These are one-way distances. Other more challenging walks include path to Dibidil from Kinloch ( 13km one way), a four hour one way walk to Guirdhil, and the Rum Cuillin Ridge Walk (22km walk). These three walks should only be undertaken by experienced hill walkers with navigation aids. Please see wildlife experience page for further details of walks in the area. Weekly ranger tours of the island run from April to October. There are guided walks ( 2 or 2½ hours long) on Wednesday and Friday. 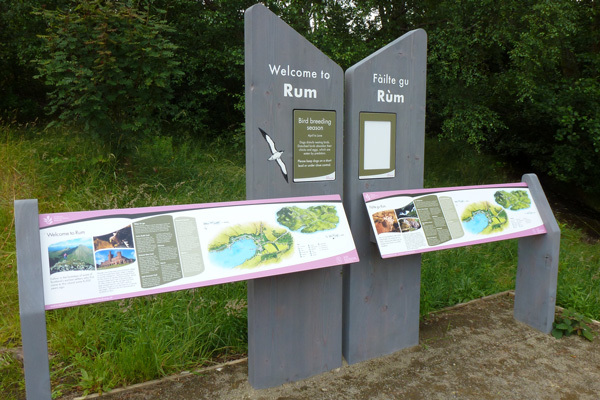 See the Ranger Programme on the Ilse of Rum website for other events and workshops.